Saturday could potentially have been a day when Instonians stumbled in the Ulster Bank NCU Premier League title race. With Waringstown expected to win comfortably at Queensway against Derriaghy, Inst were faced with a seemingly demanding home game against North Down. But what could have been a tricky assignment was anything but, Inst thumping their visitors by six wickets in a victory that owed much to Robert McKinley and Nathan Smith, the impressive seam bowlers, and some lamentable North Down batting. Inst did win a good toss, there was plenty on offer for the seamers early on, but the Comber side’s slump to 114 for nine owed as much to their inability to protect their own stumps as the excellence of the Inst bowling. Pieter Malan, the admirable North Down professional, not for the first, or probably last time, stood stall in the middle of the carnage. He was ninth man out for 64 from 83 balls, mixing stout defence and good judgement outside his off-stump with some lovely drives down the ground. His was the fourth of five wickets for McKinley, the former Larne and Ballymena bowler improving with almost every week that goes past. Three of his five victims were clean bowled and it was no coincidence that he and Nathan Smith (4-40) attacked the stumps and got their rewards. The visitors’ captain Marty Moreland, at number 11 a more competent batsman than some who had gone before, looked an angry man when he came to the crease, striking 19 from 18 balls to pull North Down up to 138 all out. They left more than 11 overs unused. The run chase was a muted affair, with Inst at times looking almost bored with how easy it all was. Andrew White (35) and James Shannon (31) barely had to break sweat in a third-wicket partnership before both fell to Alistair Shields. It hardly mattered and it was finished by the 34th over. Waringstown meanwhile were winning comfortably at Queensway. Greg Thompson struck 95 from only 91 balls, including six fours and six sixes, and there were half-centuries from James Hall and Lee Nelson, as the villagers piled up 315 for six. Curtis Moorhead recorded remarkable figures of one for 16 off his 10 overs as his fellow bowlers went round the park. Derriaghy, without the injured Kaushik Aphale, produced only token resistance in reply, Andrew Kenny making 42 from 44 balls before he was one of three victims for Phil Eaglestone. 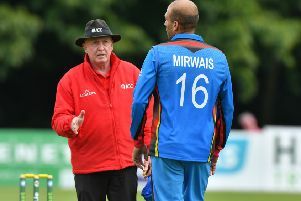 James Mitchell, the young seamer, took four for 40 as the home side were dismissed for 140. The top two stay level on points.